Welcome to my new guest post series, Ponderings on Two, where I ask a different blogger and parent of more than one child, to share their experience of having a second child. 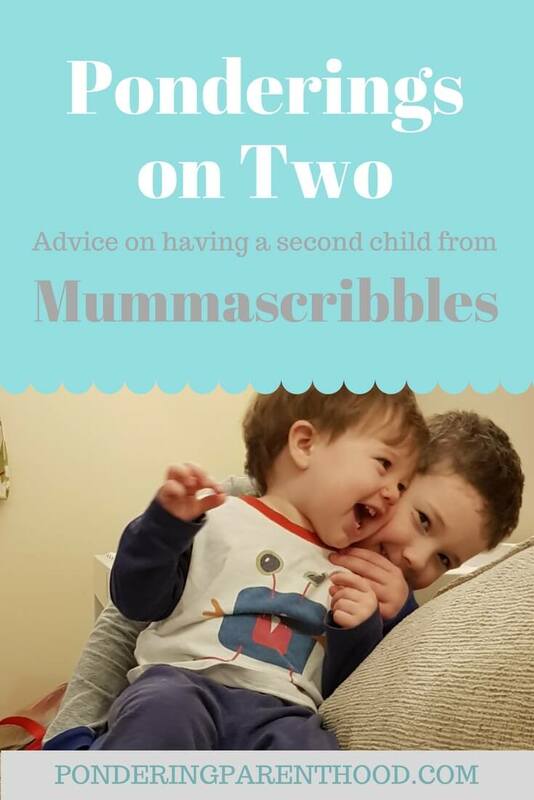 This week, we hear from Lisa at Mummascribbles. Hello! I’m Lisa, I’m 35 years young and live in Hertfordshire with my fiance and our two sons, Zach who is 5 and Oscar who is a year and a half. I used to be a full time working mum but I was lucky enough to be able to make my blog my job by the end of my second maternity leave, which means I’m now a stay at home / work from home mum. My blog documents our family life but is also a look at how I juggle everything – because there is an awful lot to juggle! There is almost exactly four years between my boys (their birthdays are 11 days apart). Originally I wanted a much smaller age gap but finances meant that wasn’t possible. I’m now really glad that was the case as I love the age gap they have. 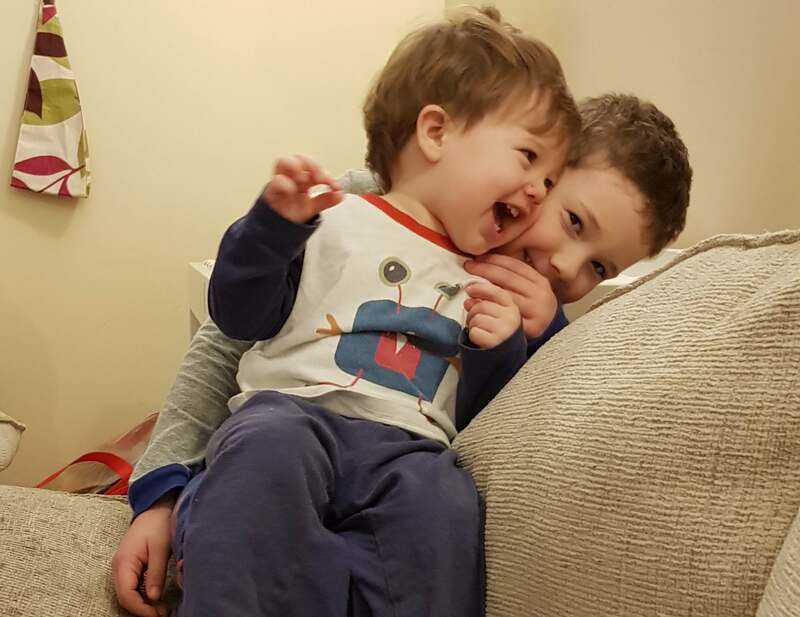 Their relationship is wonderful – obviously it doesn’t come without the usual fighting over toys or Oscar wanting to do something his big brother is doing, but the majority of the time, it’s gorgeous. They absolutely adore each other and each of them thinks that the other is the best thing on earth! The hardest thing for sure has been dividing time so each of them has focus put on them. It is Zach that has suffered the most which makes me sad, but we are starting to make sure he has some quality time with each of us away from his brother. In the early days, it was really tough when Oscar needed feeding as he was breastfed so was fed on demand. It didn’t matter what we were doing, it had to stop in order to give him food. Although Zach always needed a wee or a poo half way through the feed which I couldn’t ignore! Now the most frustrating thing is having to tell Zach to shhh when Oscar is napping! Watching their relationship grow. I’ll never forget the moment Zach met his baby brother – the smile on his face. He was so proud to be a big brother. That really hasn’t changed 18 months down the line and looking at them, I just know they’ll have each other’s backs growing up which is a fabulous feeling. A baby carrier or sling literally saved my life when Oscar was a baby. I used to wear him every day whilst I was cooking Zach’s dinner, and he would often fall asleep in it too which was a bonus! Be prepared for wonderful chaos! I don’t know if it’s just because I have two boys but life is utter chaos! It is of course wonderful, but it’s just chaotic! Also try and factor in some time alone with the eldest from early on. Even if it means ignoring the washing pile to sit and do something with them whilst the baby is sleeping. It’s easy to forget that they still need you, however old they are. Thank you, Lisa! You can find Lisa over on Twitter, Instagram and Facebook.